As you probably already know, I work with Long Buckby RFC. I know the 2016-17 season has now (sadly!) drawn to a close for a couple of months but it won’t be long until pre-season training starts, so now is the time to think about getting yourself into optimum fitness, which includes addressing any injuries or physical dysfunctions you may have gained in the past season. Rugby is a full-contact sport, and therefore makes it a war zone for injury during the course of a match. 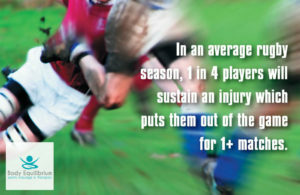 In an average season, 1 in 4 players will receive an injury which puts them out of the game for 1 or more matches. As the average player performs 20-40 tackles per match and nearly half of all injuries happen during the tackle, it’s easy to see why it’s a key topic among physical therapists and sports massage practitioners. Participate at a level that is consistent with your ability. Injuries happen more frequently between teams and players of unequal ability. The first ever rugby game took place between Scotland and England (Scotland won!). Originally a try had no value but allowed the attacking team to “try” a kick at goal. If successful it converted a try into a goal, hence the name. Rugby balls are oval because they used to be made using inflated pig bladders. Rugby is the national sport of 3 countries; Wales, Madagascar and New Zealand. The whistle used for the opening match at every World Cup is the one used by Welsh referee Gil Evans for an England-New Zealand match in 1905. The notion of singing a national anthem before a sporting event originated at a rugby match. The current record for the highest scoring game ever is the match between the All Blacks and Japan in the 1995 World Cup (the All Blacks beat Japan 145 to 17). If you’ve ended up with a rugby injury, get yourself booked in for a sports massage so you’re ready for next season. Treatments are available in Secrets Boutique Salon in Daventry. Call 07494 100165 or email info@bodyeq.co.uk for your appointment.